Not every game in the App Store is an intellectual or technological triumph. In fact, some of the most successful apps are also arguably the stupidest. Bubble Wrap is a great example of this, since it is only slightly less mindless than watching paint dry. But does the world really need another Bubble Wrap? Isn’t one mindless app enough? tappixels doesn’t think so and sets out to test this theory by providing us with a minimalist take on the mechanical tapping genre. Instead of digital bubbles, tappixels goes with a neatly uniform grid of gray or red squares. You can elect to either turn them on (gray to red) or turn them off (red to gray), because what kind of game would this be without options? Other options include exactly how much time you want to spend per level, from 10 seconds to 90 and how you want the grid to appear. Normal just provides a full grid, where casual randomly generates squares until the grid is fully filled in. 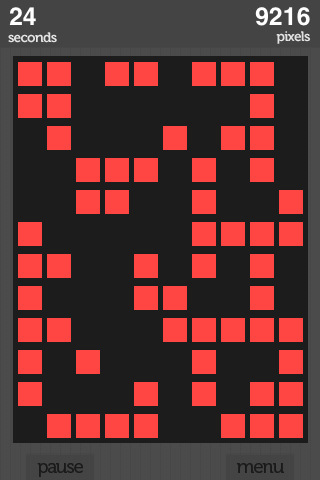 Once you start the level, just tap the squares as fast as you can and rack up points/pixels. From a technical standpoint, the game works great, thanks to a very clean and responsive interface, but the big question looming in my mind was, “What’s the point?” Perhaps I expect too much from the game, but I just didn’t get it. Unlike Bubble Wrap, which has a real world counterpart to back up its appeal, tappixels struck me as the faster-paced equivalent of filling in grid squares while bored in math class. The game performs beautifully, but the utilitarian design scheme leaves it with nothing to hold any interest. It feels bad to come down on tappixels so hard, because it’s clear a lot of time and effort went into making it, but it plays like a very clean and polished tech demo instead of a game. While the general design elements look very professional, the overall effect is oddly sterile and charmless. The sound in particular is problematic, as there is no music or option to play your own, and the generic “tick” of each tapped square lacks the visceral appeal of a bubble “pop”, so the whole experience feels empty. With more creative drive, I could see this developer pushing out some great things, as the technical performance is smooth and details like the help and menu screens look fantastic, but the game itself is far too bland to succeed. It might serve as a temporary diversion were it free, but it’s definitely not a game I would pay for, even at the low price of $0.99. AppSafari review of tappixels was written by Tracy Yonemoto on August 26th, 2010 and categorized under Action, App Store, Games, Puzzler. Page viewed 2707 times, 1 so far today. Need help on using these apps? Please read the Help Page.